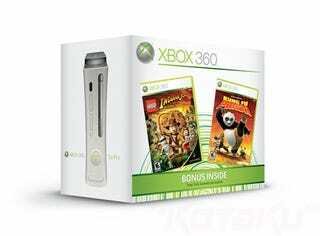 To go with the new Xbox 360 experience, Microsoft today announced three new Xbox 360 bundles. All three will feature prominent Netflix advertising on the front, and all three will see the consoles packed in with free games. The Pro and Elite models will include Lego Indiana Jones and Kung-Fu Panda. Not a bad deal. The Arcade will come bundled with...Sega Superstar Tennis. It's free too, but...yeah. Nothankyou.jpg.